Boulevard 105 is a property providing self catering in Margate for up to 2 guests visiting the South Coast region. Boulevard 105 offers self catering accommodation for four guests. 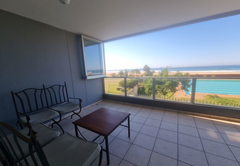 Situated in a secure complex, the apartment is across the road from the main swimming beach as well as the municipal swimming pool. 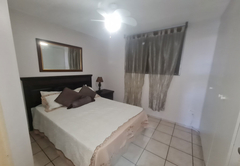 The one bedroom apartment is air-conditioned. 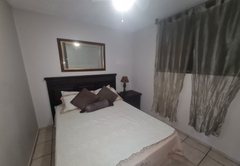 The bedroom is furnished with a double bed and there is one bathroom. The lounge is comfortably furnished and has a sleeper couch and a TV with DStv. 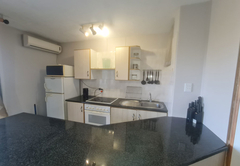 The kitchen is equipped for self catering and there is a dining area where you can enjoy a meal together. There is an iron and a fan available. There is on site parking provided. 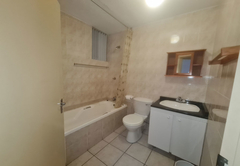 1 Bedroom unit situated in the heart of margate in a secure complex block. 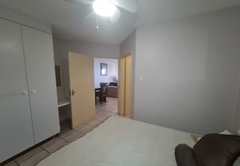 This unit is directly opposite the Margate main beach and has aircons in the units. Response timeBoulevard 105 typically responds to requests in 5-10 minutes.